I stood on that bridge so many times, train spotting watching the signals to see when a train was coming. You could hear a bell ringing in the signal box and then the man in the box would start to turn the big wheel that would close the gates. If it was ‘peg brum’ the train would be coming from Birmingham towards Coventry. If it was ‘peg Cov’ the train would be coming from Coventry towards Birmingham. 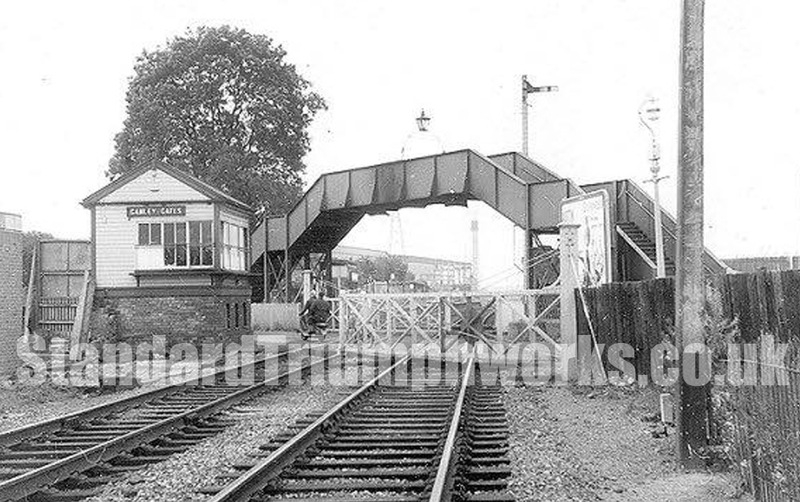 Most were local trains which stopped at all stations on the way, Tile Hill, Berkswell and so on. They were hauled by tank engines. The main express hauled by a ‘namer’ was the Midlander which roared through Canley at ten to five every evening, the engine was a Jubilee class often Meteor, Ulster, Connaught etc. Then I would walk home over Hearsall common to my home in Chapelfields. Simple pleasures because that’s all we had then. I remember walking from canley over that bridge and past the triumph car factory “never forget the smell of all the cars in the front yard” on my way to hearsal common to catch my bus to woodlands school, thank you great memories! Can you remember when the stream that ran through Hearsall common was polluted with cutting oils from the Standard Triumph factory? Imagine that nowadays.